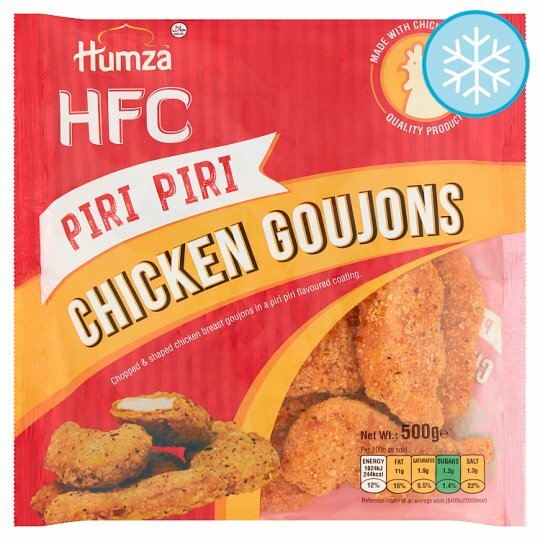 Chopped & shaped chicken breast goujons in a piri piri flavoured coating. Cooking Instructions (General): For best results always cook from frozen. Oven cook (From Frozen): Remove all packaging and place on baking tray in the centre of the pre-heated oven (220°C) for 12-15 minutes or until piping hot throughout. Shallow Fry (From Frozen): Remove all packaging and deep fry in hot oil (180°C) for 4-5 minutes or until piping hot throughout.